If you’re American, you may have thought that the Patty Hearst case was the first time the concept of Stockholm Syndrome was used. The most famous case of Stockholm Syndrome in America occurred in 1974 when Patricia Campbell Hearst was kidnapped by members of the Symbionese Liberation Army, which took her hostage to gain the release of some imprisoned members of the group. She bonded with her captors, called her granddad, William Randolph Hearst, a fascist, took up a machine gun and robbed businesses and made explosive devices, all allegedly in voluntary service to the SLA. However the first time the concept was used was in 1973 involving a hostage situation in the main bank of Stockholm, Sweden. Budreau, whose “Born to Be Blue” about the reimagining of Chet Baker’s jazz comeback in the sixties, now departs wholly from that biographical subgenre to tackle what is unlikely the first case in which a hostage bonds with her captor, but is the first time that the “Syndrome” term was used. Ethan Hawke departs from his restrained performance as a minister grappling with despair in “First Reformed” to go over the top, and Noomi Rapace shucks her over the top performance as the “Girl with the Dragon Tattoo” to play a meek bank clerk. “Stockholm” is off and running when Lars Nystrom (Ethan Hawke) adjusts his fake, hippie-style hair, combs his mustache, strolls into Stockholm’s central bank, removes a machine gun from his duffel, fires a few shots at the ceiling, and give every impression that he’s out for money. He does ask for a million, but his real goal is to get the cops under chief Mattsson (Christopher Heyerdahl) to free his bank robbing pal Gunnar Sorensson (Mark Strong) from jail. As the two criminals settle in for what will be five days and the police occupy the second floor of the bank, Lars both terrorizes and comforts his two hostages, Claire (Bea Santos) and Bianca Lind (Noomi Rapace). As a wife and mother, Bianca would not seem the type of person who would be taken in by Lars, except that Lars is the kind of person that women say they’d like to have fun with but not marry, while Bianca’s husband Christopher Lind (Thorbjørn Harr) is the groomed, steady type, the marriageable kind, taking care of the two kids during the hostage crisis. In the film’s most absurd moment, when Christopher shows up at the bank to see what his wife is up to, Bianca patiently gives him a fish recipe so he can return home and feed himself and the little ones. This is the kind of movie that may disappoint thrill seekers who think it will be another “Dog Day Afternoon,” but will encourage a potential audience interested in human psychology, particularly in the surprising ways that people can react when in a situation that should inspire nothing but terror. Ethan Hawke and Noomi Rapace play off each other, convincing us in the audience that in spite of all logic, they get to do some smooching as the crisis proceeds day by day. Almost all action takes place inside the bank, which could allow for some playwright in the future to consider the plot for the legitimate stage. The inspiration for the movie came from a New Yorker magazine article called The Bank Drama published Nov. 25, 1974 about Jan-Erik Olsson’s takeover of Sveriges Kreditbank in Stockholm, where the hostage-taker and an accomplice held 4 hostages for 6 days in Aug. 1973. Jon Hamm is a painfully handsome middle-aged actor who was perfectly cast in “Mad Men.” He fits in handily as a Madison Avenue executive and was born to smoke and drink while selling expensive advertising to major clients. He should be considered to be the next 007 provided that he can imitate the king’s English. He is well cast in “Beirut.” He still drinks and smokes, occasionally raises his voice. He is a negotiator as he was in the brilliant TV episodes, so adept that even the bad guys in the Middle East insisted that they would talk only to him to arrange an exchange of prisoners. Tony Gilroy’s story for this new release is as confusing as Brad Anderson’s direction. From time to time a bomb goes off in Lebanon’s capital, and occasionally there is the rapid fire of AK-47 as bad guys in the usual headgear and mouth coverings do what they do for reasons that are not always clear to Americans—who think that the only reason that people take risks is for money. 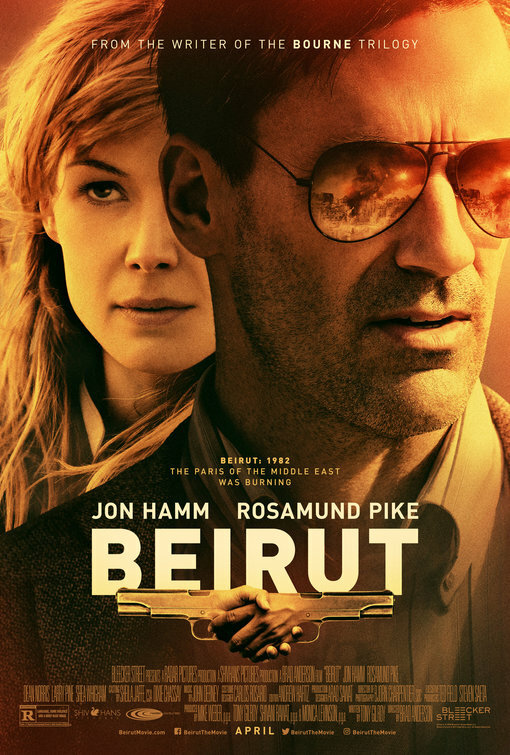 As Mason Skiles, Jon Hamm is shown in Beirut in 1982 with flashbacks to his time in Lebanon’s capital ten years earlier. In 1972 things were looking up for Skiles, then a diplomat. He enjoys the company of his lovely wife Nadia (Leila Bekhti). The couple even adopted Karim (Yoav Sadian Rosenberg), a Palestinian refugee who is now a cute kid of 13. But Karim has a secret: his brother Abu (Hicham Ouraqa) was a bad guy responsible for the murder of Jews during the Munich Olympics. Just as Karim and Skiles are having a nice chat, a deadly terrorist attack during a diplomatic party leaves Nadia dead. Skiles, now in no mood ever to return to the middle east, takes on a job at home as a labor negotiator but is called back in 1982 because Cal Riley (MarkPellegrino), a good friend, is being held prisioner. The terrorists want to trade him for Abu Rajal. It’s no wonder that they want only Skiles. His adopted son Karim (Idir Chender) is now grown up, a fighter for the Palestinian cause, and feels certain he can trust his stepdad to pull of the trade, but the sinister U.S. diplomats are divided in motives leaving only Sandy Crowder (Rosamund Pike) to support the negotiations. What could have been a film to break new ground as did the filmmakers for the superb “Mad Men” series instead create a same ol’ retread of spy stories, which in itself would not be so bad if the story did not plod along with boatloads of banter which do nothing more than confuse the viewer further. This is a surprise coming from the screenwriter, Gilroy, whose “Argo” in 2012 presented an ingenious ruse to get six people who had escaped from Iranian clutches out of the country by setting up a fake Canadian film company. “Argo” was not confusing, was full of original ideas, and with excitement that flowed organically from the plot. This one’s a dud.